Like most of the country right now, February has been cold, icy and snowy here in Missouri. There has been a few days of brief warm spells, but the ground has been mostly frozen. Despite the weather I’ve managed to get out and scan the dirt. I was going through a dry spell for silver despite finding some wheats and several modern coins. A few days ago the temperature managed to climb into the 40’s. So after work I hit a local old hunted out park to see if I could hit a random silver. With only a hour and half till dark, I crawled around through the iron with the Etrac. I hit a deep wheat at about 6-7″ and my hopes for silver climbed. It was starting to get dark (I had to turn on the backlight to see the screen) and the wind started picking up. Despite shaking from the cold and a couple of phone calls (Really!!) I trudged along determined to find silver. On a slow pass the Etrac chirped and the number 9-44 popped up. The back sweep (lack of a better term) produced silence, then another chirp 11-43, then 11-45. My hopes of finding silver peaked, the target was at the very edge of my ability to detect it. So I managed to cut out a deep frozen disk of soil and started probing the hole. Nothing! Really!! So I scooped out more soil, not frozen, and probed again. I heard the sound of hope in the hole. Then a dull silver disk popped out, a Mercury dime! So immediately I pulled out my phone and took a picture to send to my hunting partners 🙂 Silver number 12 had been found! I’m really considering buying a larger coil for the Etrac. I still think there’s plenty of silver in old parks just out of reach of a stock Etrac. I’m just not sure if I want to spend a couple of hundred dollars to find out right now. This Merc was the first coin I found where I only heard “chirps”, not a solid or mostly repeatable signal. I heard a chirp once out of every third or fourth swing. So being partially frozen and moving extremely slow produced a silver for me. I’ve been over this ground at least five times before, but probably moving too fast to hear the chirp. Another case for extensive gridding? The weather was great this last weekend and I knew I’d better get out with the Etrac. I decided to hit the last two old parks where I found silver. 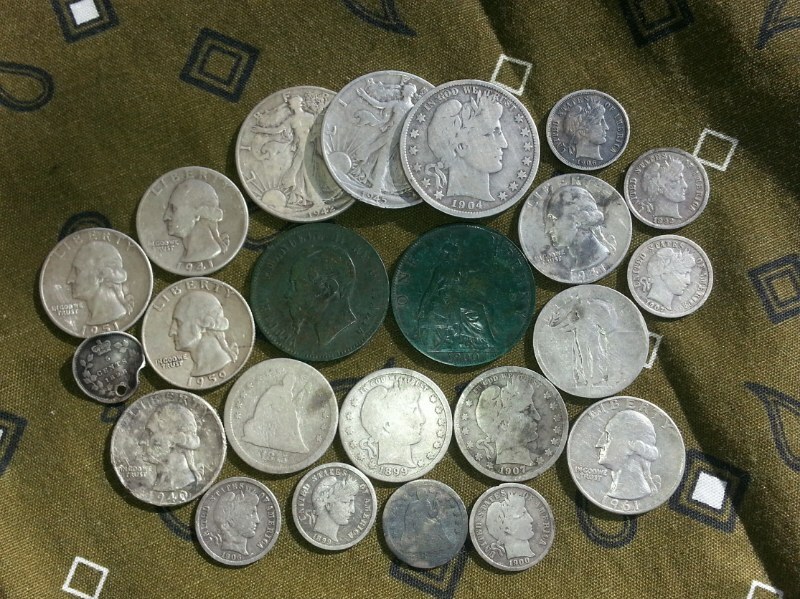 I went back to the park where I found several silver dimes including a Barber. There’s a lot of ground there to cover and I covered a pretty large portion of it. I didn’t find any new hot spots or a random silver. I did find a deep dateless wheat and several modern coins, but no silver. I still think there’s more silver there, just deeper. Out of curiosity I decided to hit a fairly large grassy area in between two streets right next to the park. I found a Merc and several modern coins. I will need think about hunting these kinds of places in the future. My next stop was the park where I found the silver quarter and Mercury dime. The area was densely littered with nails and I hunted it heavily in multi tone before. So to satisfy my curiosity I hit it hard in TTF to see if I missed anything. My first good target was 1244 mixed in with a lot of iron grunts. I was very surprised to find a 1906D Barber dime! I know when I hunted in multi tone, the etrac struggled to sort through all the targets even though I was going at a snails pace. I also noticed the soil was heavily mineralized, black grainy etc. I ended up finding a wheat and several memorials I missed before too. So this experiment proved something I wondered about over the last year. Multi tone doesn’t always find everything, regardless how slow you go. There’s just too many different variables in the environment at different locations to be perfect every time. So if your gut tells you there should be more, go find out. So if you have an Etrac, why not use all of its abilities? In my case, it put another Barber on my board! Now I just need to find more silver quarters and half dollars 🙂 Good luck!